Happy Easter :), we have stunning weather this long weekend. We were up to a warm 19 Celsius yesterday I hope we see the same today. 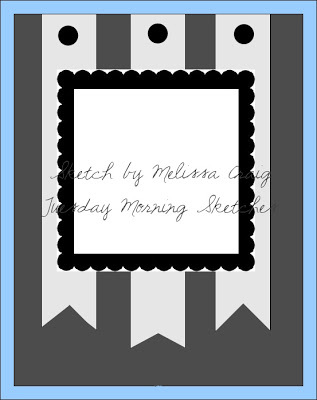 I have a cute tag to share today. I cut the tag from card stock and added some Designer Paper, I fussy cut a little hill and I lightly inked all the edges. I used my SCAL software and Cricut to cut little clouds from glitter paper. The bunny was heat embossed then fussy cut as well and popped up with foam tape. I used glitter pens for the nose and pads on the feet and I finished with some glittery ribbon. Supplies: Natural white card stock, Designer Paper - Memory Box, The Alley Way Stamps - Spring has Spring, SCAL clouds, misc ribbon. 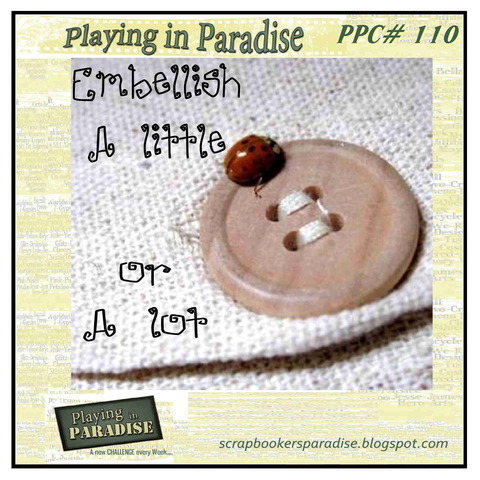 Another Friday is here and a long weekend too boot and we have a new Playing in Paradise challenge for you, I am the hostess this week and the challenge is to use embellishments. I don’t know about you, but I have enough embellishments in my stash that I could bling out the whole Grand Canyon. I will admit, I lean more to the use ‘a little’ when it comes to embellishments. I have tried to do one of those stunning creations that has multiple flowers, poofy bows and pins, but I just don’t seem to have the knack for it. I am happy with brads, gems and the occasional flower and I do love my foam tape and that has to count for something :). My brother loves to fish, so of course I wanted to make something Fishy for his birthday. I started with the focal image and offset it, I added multiple layers to create a frame of sorts. I used an embossing folder to add some texture to some corner pieces then popped them up with foam tape. I finished with some candy dots and twine. 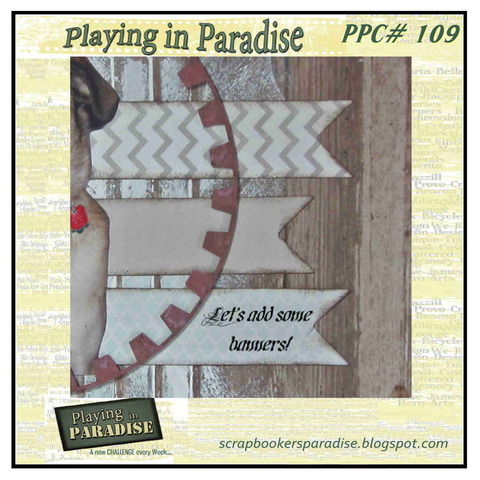 Stop by the Scrapbooker’s Paradise blog to see what the challenge team has created, play along with the challenge and you will be eligible to win a prize. A have a CAS card this morning for the current Muse card challenge. 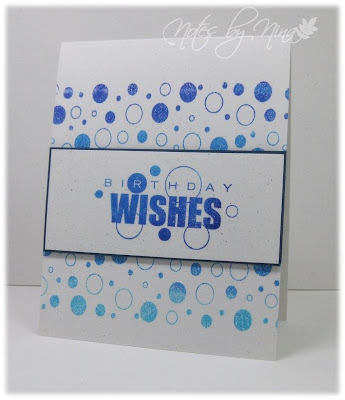 This birthday wishes stamp with the circles is a favorite so when I saw this week’s Muse card I was happy to ink it up. The card by Ardyth Percy-Robb inspired me with wonderful colours and fun shapes. I stamped the background pattern and sentiment using my new Kaleidacolor ink pad, I love these beautiful colours, I also added a thin blue matte for my sentiment and popped it up with foam tape. 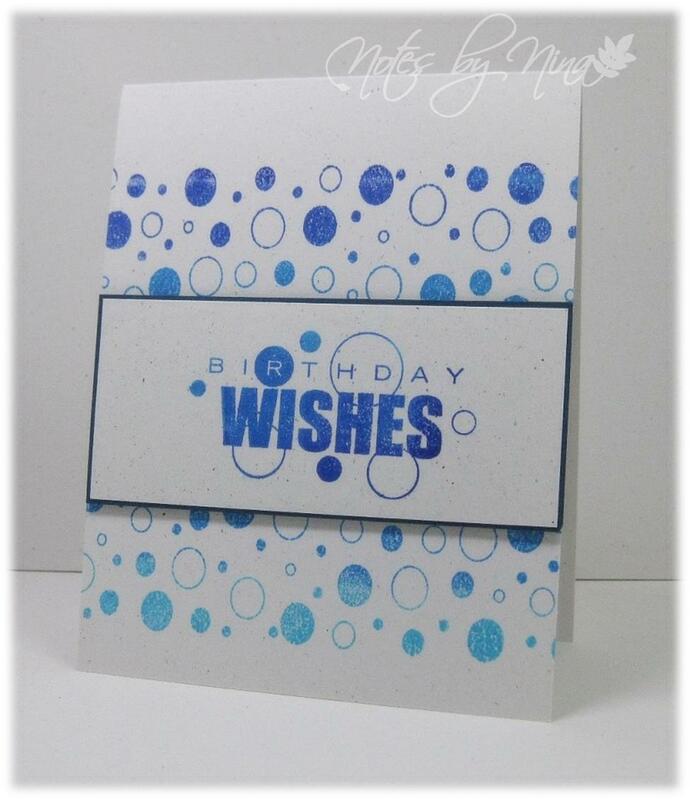 Supplies: Natural white and blue card stock, Fiskars - Polka Dots, Inkadinkado - Birthday Wishes. 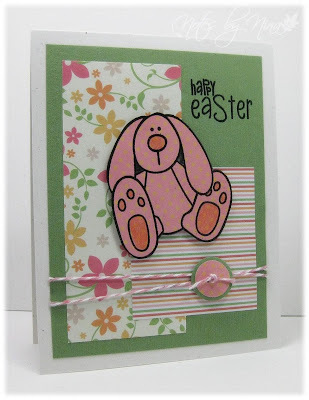 I have been procrastinating about getting a few Happy Easter/ Happy Spring cards done for weeks. I finally made a couple of CAS cards last night so I could pop them in the mail hoping they will make it to their destinations on time. I have some new papers to play with from Dovecraft, these pretty papers are from the 6x6 Garden Party pack. 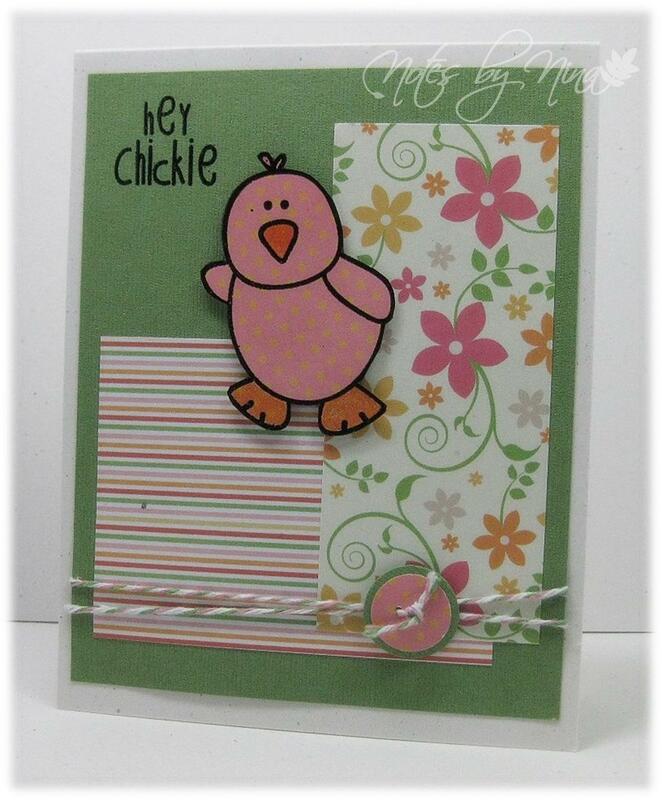 I heat embossed the chick ad bunny and fussy cut them out and popped them up with foam tape. I added a little color to feet, beaks and noses with some glitter markers. The sentiments are also heat embossed in black and I finished with some twine and a button that I made with circle punches. Supplies: Natural white and green card stock, Designer Paper-Dovecraft, The Alley Way Stamps - Spring has Sprung, twine, misc punches. I had the most wonderful weekend, we had a family reunion of sorts for my brother's birthday. It has been a very long time since we have all been together and it was fantastic. It was definitely nice to visit my hometown too, I am a small town girl at heart and it is nice to get away from the city once in a while. 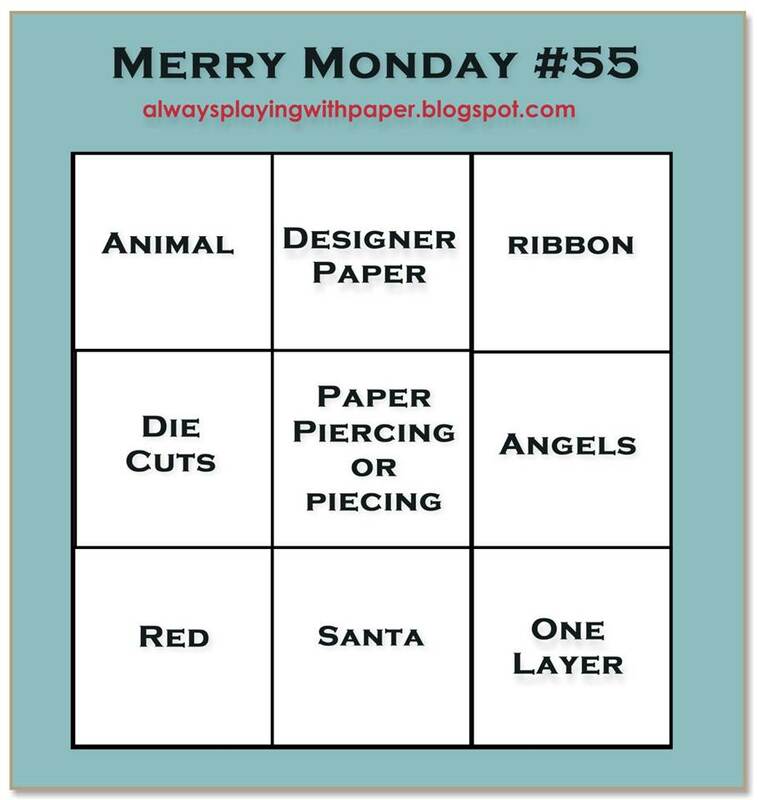 Time for a new Merry Monday Challenge and Lesley has a Tic Tac Toe grid for us to work with. 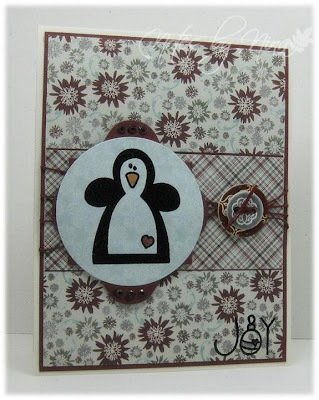 I chose Animal, Die Cut and Red, isn’t this little penguin cute. I heat embossed the penguin in black and coloured his little heart with a glitter pen. 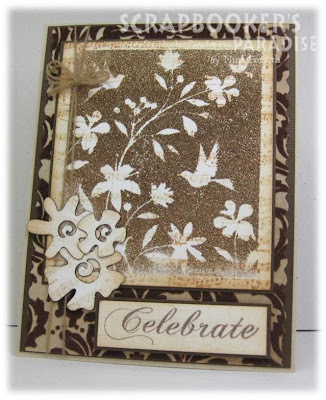 I backed it with some die cuts from Spellbinders. I found some chipboard buttons in my supplies that worked well with DP and I heat embossed the sentiment and added a little silver glitter marker to the bulb. I finished with twine and some gems. 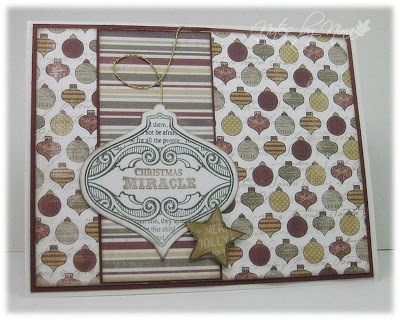 Supplies: Natural white and burgundy card stock, Designer Paper – Carta Bella, The Alley Way Stamps – No Peeking and Jolly Holiday, twine, Spellbinders, misc chipboard button and gems. Stop by Lesley’s blog, Always Playing with Paper to see what the Design Team has created. 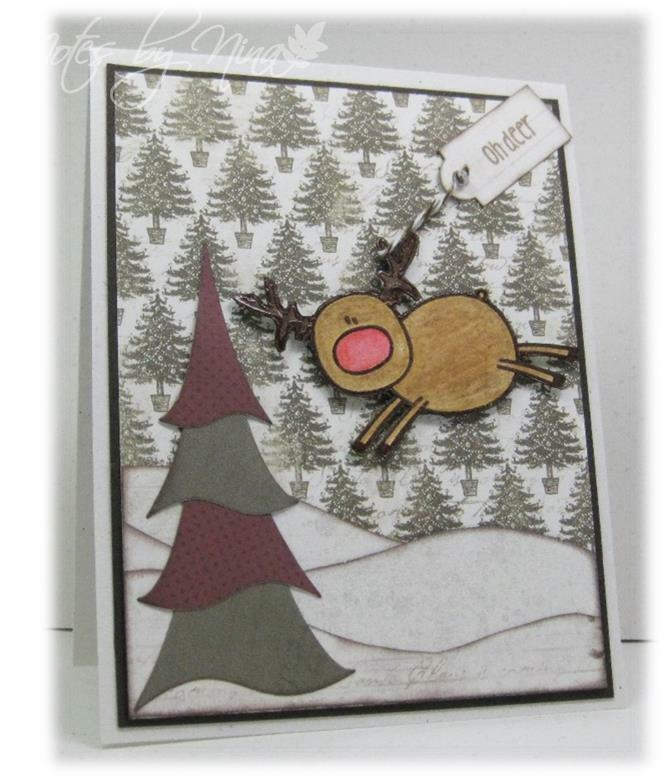 Join us and play along, it is never to early to get a start on this year Christmas cards. Happy Friday !! Most Friday make me smile a little, mostly because I know I have a weekend ahead of me. It also helps that spring is in full swing here in Victoria, oh we get a little rain.. ok well a lot but all the beautiful cherry blossoms are in bloom as are the daffodils and crocuses. 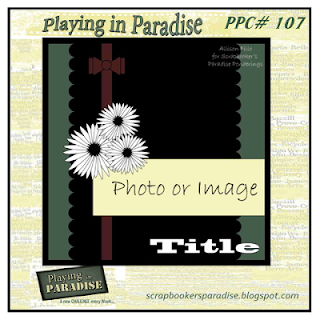 We have a new Playing in Paradise challenge for you today , Linda is our hostess this week and the theme of the challenge is to use Banners. I seem to be idea challenged as of late so I used the sketch from this week’s Tuesday MorningSketches to help me along. Isn’t this Basic Grey paper pretty, I spotted it this past weekend and could not wait to use it. I lightly inked the edges then added a brown base, I did the same to each of the banners. I heat embossed the sentiment then finished with some gems. 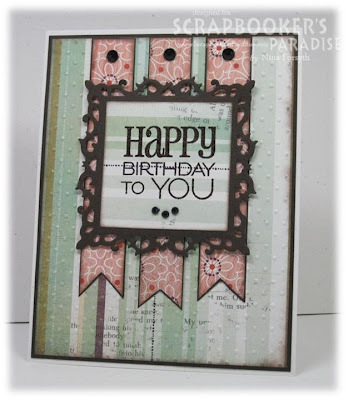 Supplies: Natural white and brown card stock, Designer Paper – Basic Grey, Verve – Birthday to You, Spellbinder die cut and gems. 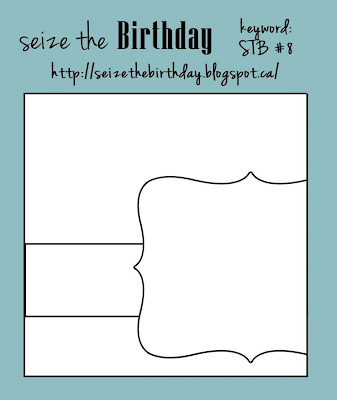 Stop by the Scrapbooker’s Paradise blog to see what the challenge team has created, join us for the challenge and you will be eligible to win a prize. Happy Monday, it is time for a new Merry Monday Challenge. 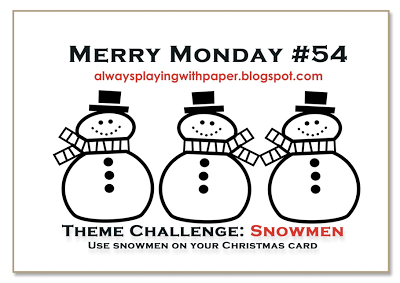 This week our theme is snowmen. 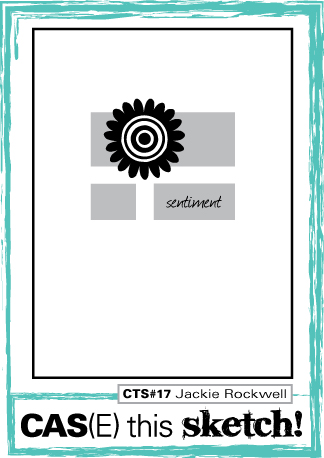 I tried for a clean and simple style card. 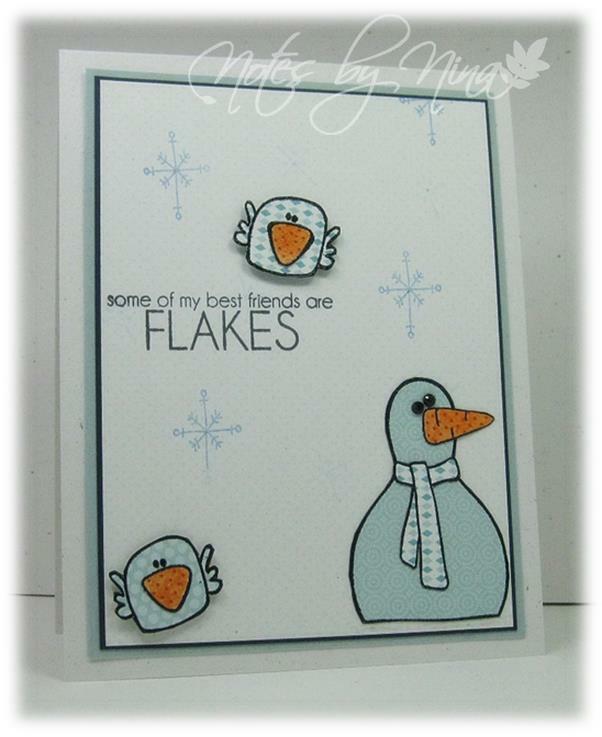 I paper pieced these adorable little friends, and I added some background snowflakes. I finished with the sentiment. Supplies: Natural white, light blue and navy card stock, Designer Paper-Carta Bella, The Alleyway Stamps - snow much fun, Recollections gems. Stop by Lesley's Always Playing with Paper to see what the design team has created. 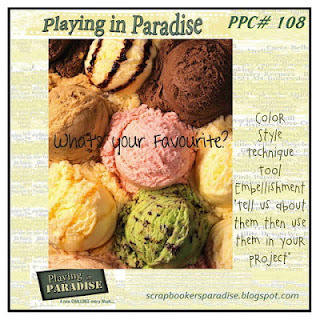 Happy Friday, we have a new Playing in Paradise challenge for you , Dawn is our hostess this week and our inspiration is 'What is your Favorite'. One of my favorite craft supplies in my stash right now is my twine, I purchased a number of spools from the Scrapbooker's Paradise online store recently so that is the focal point of my card. I used one of the craft sticks I store my ribbon on and wrapped different colours of twine around it. It is held in place with some Mod Podge and popped it up with foam tape. I used a couple of free digital images from The Alley Way Stamps. 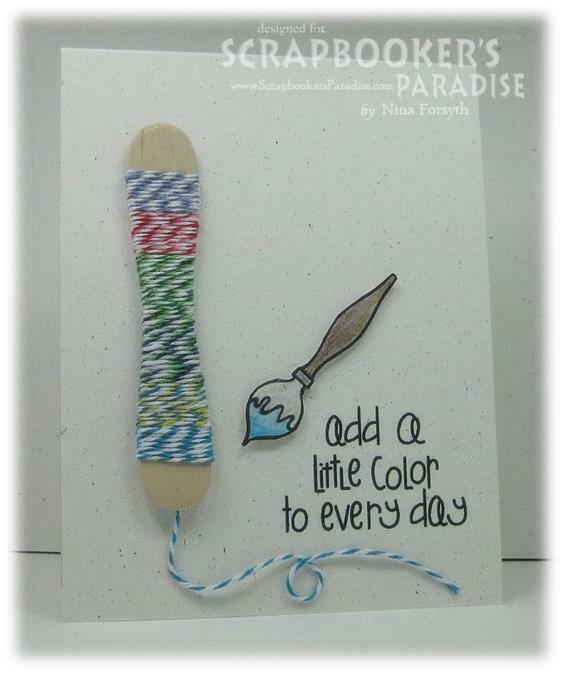 Supplies: Natural white card stock, The Alley Way stamps - Free Digi, twine, craft stick. Please stop by the Scrapbooker's Paradise blog to see what the challenge team has created. Play along with the challenge and you could win a prize. Happy Wednesday – I was able to talk my sister Barb and sister-in law Judy into another family technique challenge. Considering how I made the last project into a major production I am actually surprised at myself for wanting to give something new a try so soon. This challenge is to create a mosaic and using Mod Podge (or equivalent). You can see the video we used for the technique tutorial HERE. The challenge for me for this project was to actually get motivated to start, once I did my card just came together. 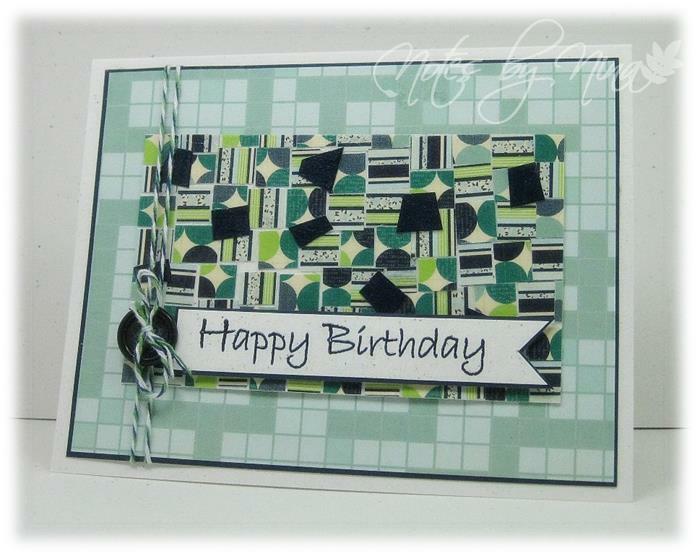 I started with cut pieces of designer paper and slowly started to added them to a background piece of card stock. As in the video I did this in small little sections, I was surprised at how quick the Mod Podge dried. I added some solid cardstock to cover some blank spots and then put a nice layer of Mod Podge over the whole thing and once it was dry I trimmed up the edges. I used a natural white card base and I added a layer of blue cardstock, then a layer of designer paper. I glued the mosaic panel in place and added the sentiment. I finished with a button and some twine. Although card was not CAS to make, I like the clean lines of this card. 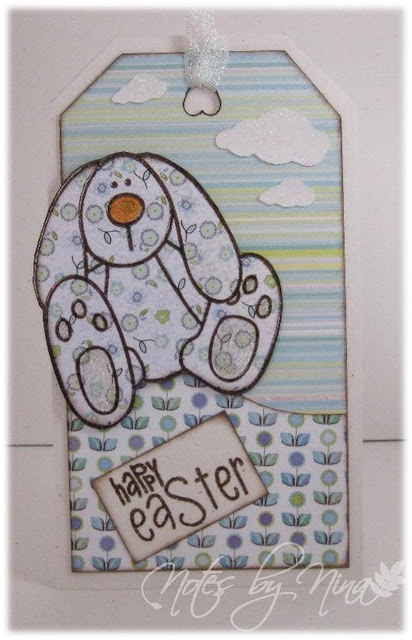 Supplies: Natural white and navy cardstock, Designer Paper -Bo Bunny , twine and button, Mod Podge. Boy is raining hard here today, it is days like today when I am happy for an indoor job. I had a request from a friend for a Bollywood style Wedding card. I started out with lots of bling but it just did not come together like that. I admit I spent hours playing with ribbon and I must have made these swirls a half dozen times, with shimmery paper and without, with spritz, then with glitter and finally with a nice thin coat of Mod Podge. half pearls and crystal gems. Supplies: Natural white and brown card stock, Designer Paper – Authentique, TPC – Congratulations, K&Company brad, satin ribbon, Sizzex die cut, misc pearls and gems. The card was happily received :) even without a while lot of glitter and glitz. 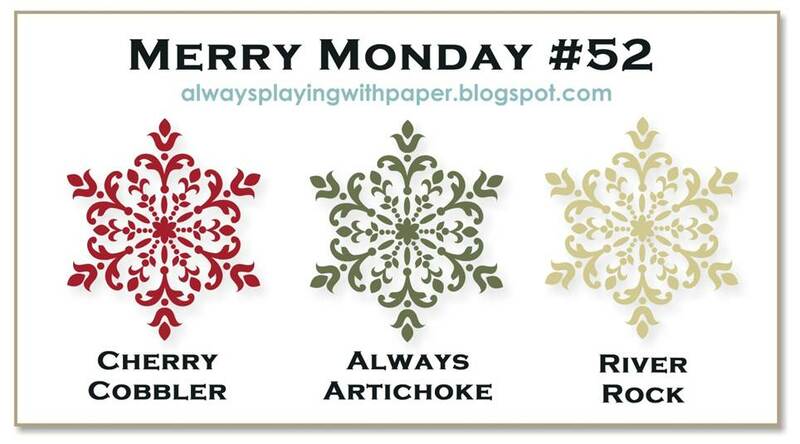 Welcome to a new Merry Monday Challenge, Lesley has a sketch for us this week. I used a Spellbinders ornament die cut for this card and used a set of Just Rite Stamp for the focal point, I added in some twine and finished with a star. All the edges are lightly inked in brown. 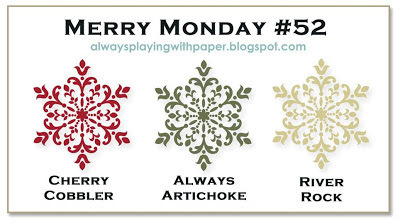 Supplies: Natural white and burgundy card stock, Designer Paper – Carta Bella, Just Rite-Christmas Miracle Ornaments, Spellbinders die cuts, twine. Don't forget to stop by Lesley's Always Playing with Paper to see what the design team has created. Another week had come and gone, I swear time is on fast forward. However, it is Friday and the weekend is nearly here. We have a new Playing in Paradise challenge for you today, Allison is our hostess this week and our inspiration is a sketch. Once again I took a complicated route with a card that should have been simple enough, I did alter the sketch a little to cover a mistake. 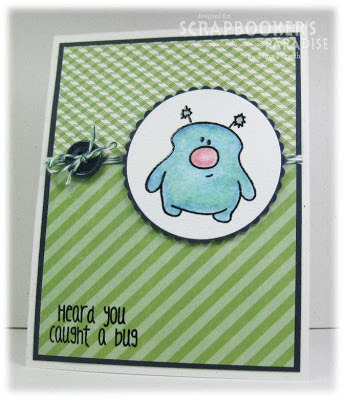 I stamped the background and added some ink to the edges using Distress inks. I then used heat and stick embossing powder to apply the glitter. I finished with some die cut flowers and some woolly twine. Scrapbooker's Paradise online store has a fantastic selection of glitter, Hero Arts stamps and Distress inks. Supplies: Natural white, kraft and brown card stock, Design block: Old Letter Writing, Flower Bird Garden – Hero Arts, Sizzix die cut , twine. 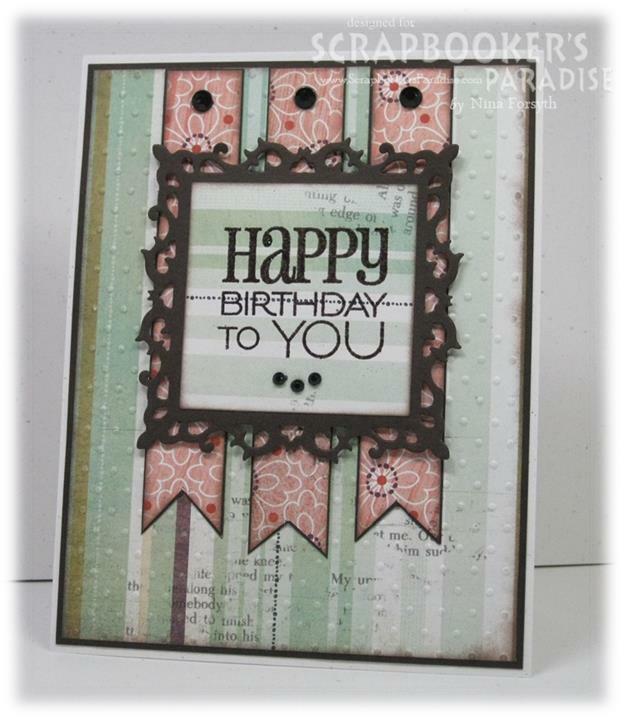 Please stop by the Scrapbooker's Paradise blog to see what the challenge team has created. Play along with the challenge and you could win a fabulous prize pack. 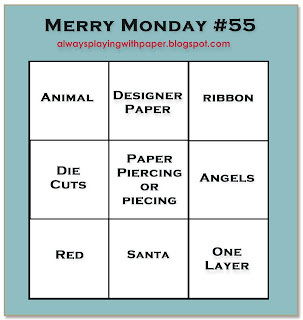 Welcome to a brand new Merry Monday challenge, we have a colour challenge to inspire us this week. I cut out the snowy hills then used Spritz on them to give them a little sparkle. The deer is heat embossed and fussy cut, I used my water colour pencils for colour and popped up with foam tape. I added a little twine to hang the sentiment. 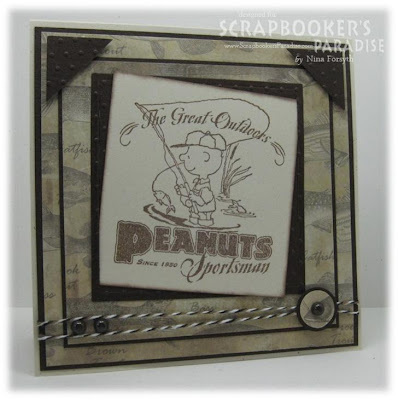 Supplies: Natural white and brown card stock, Designer Paper-Carta Bella, The Alley Way Stamps-FaLaLa, twine, Dee’s Distinctively and Cuttlebug Die cuts. 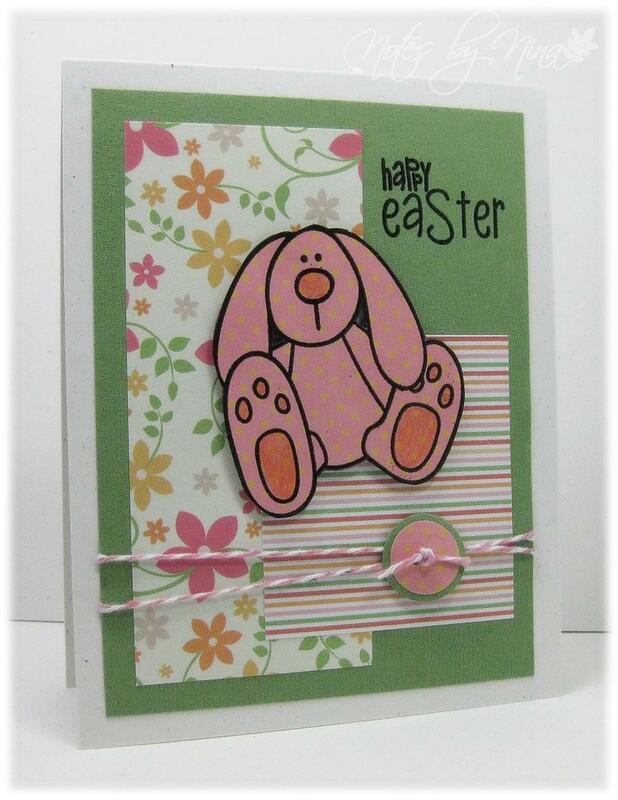 I am on a roll, I love it when I get some time to make cards. 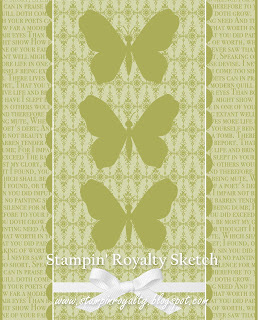 I am trying a new challenge with this post, the Stampin' Royalty Challenge. 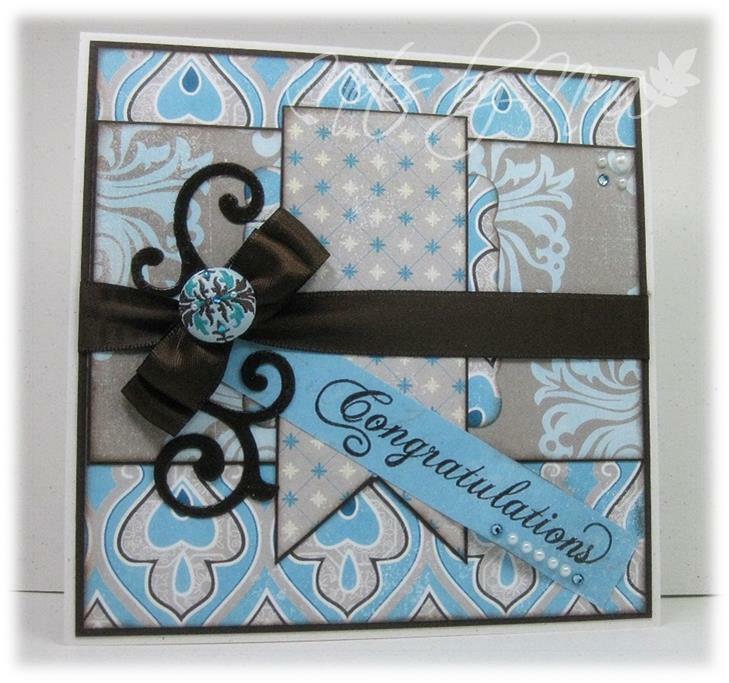 This card came together really quickly, I added two different shades of blue card stock to the base then some designer paper. 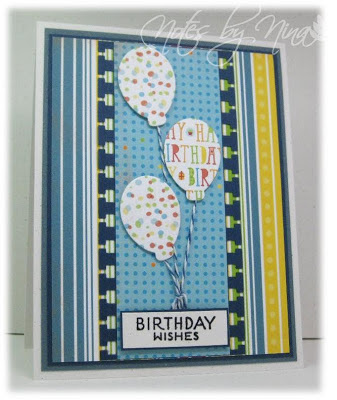 I punched some navy card stock for the center strip then I used my balloons2cut die cut and added some twine. I finished with a sentiment. 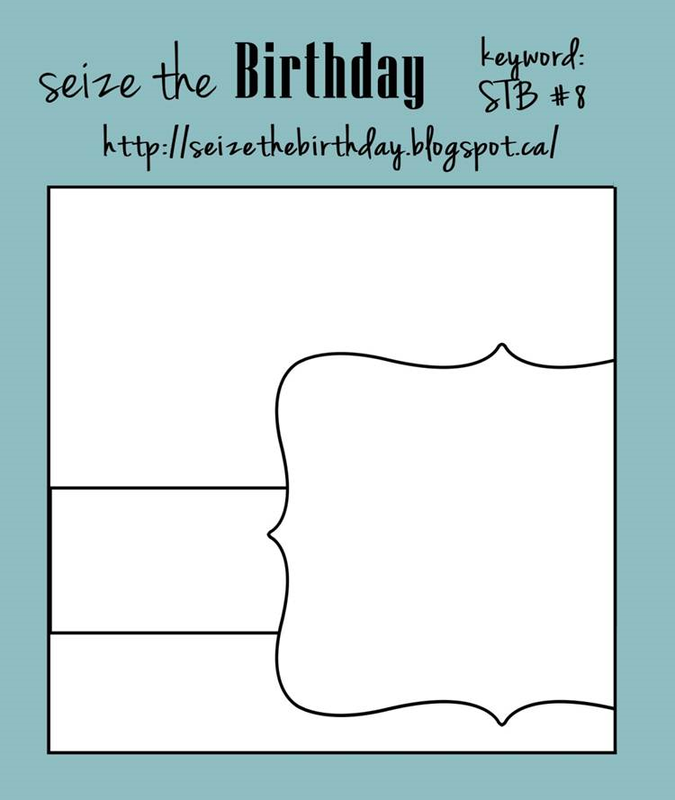 A quick second post for today, I needed a birthday card for my father-in-law and used the current Seize the Birthday sketch. I used a spellbinders die cut then stamped the fish in brown. I used twine for fishing line and added just the smallest bits of gel marker for some sparkle to look like it was wet. I finished with the sentiment. 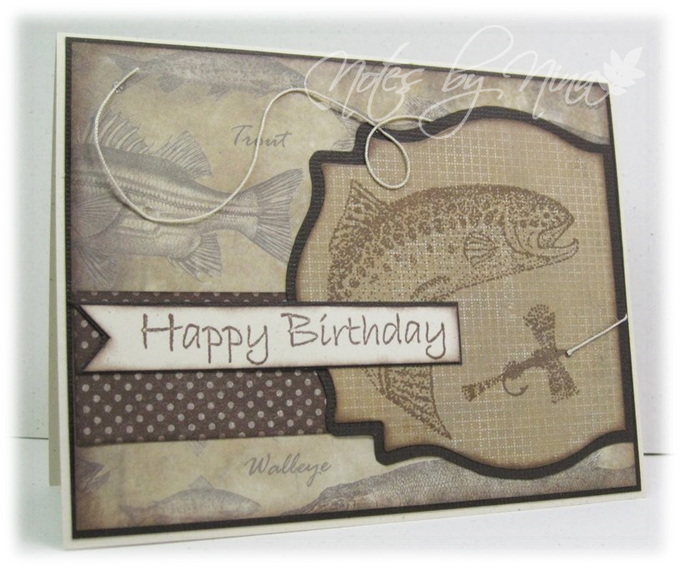 Supplies: Natural White and brown card stock, Designer Paper-Karen Foster Designs, Close to My Heart-Catch of the Day, The Artful Stamper-Happy Birthday, twine. It is a stunning day here in Victoria with the sun shining and all the spring blossoms in bloom. The 37th annual flower count is on so I though with the pretty Daff's in my garden smiling away it is what I will use as my inspiration for this weeks Cas(E) this Sketch! I should be making some cards that need to be popped in the mail but I was distracted :). I heat embossed the Daffodils with black embossing powder then fussy cut them out, I coloured them with my Tombow markers. 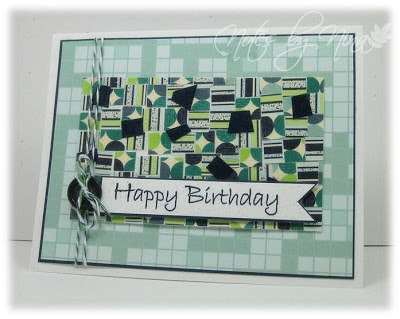 I stamped the patterns for the two die cut shapes then added a little ink to the edges. I heat embossed the sentiment then finished with some twine and a button. Supplies: Natural White and green card stock, Designer Paper-Echo Park, Verve-Birthday Phrases, Technique Tuesday-Stems(Jan2013),The Alley Way Stamps-Cover Ups, twine, button, Spellbinders. It's Friday :) and the 1st of March, where did Frebruary go?? We have a new Playing in Paradise challenge, Jessi is our hostess this week and she is challenging us to create something using the colour green. I don't know about you but when I am sick I always feel a little green. I could not resist inking up this cute little 'bug'. I heat embossed this image then coloured it with my watercolour pencils, I also heat embossed the sentiment in black then finished with some twine and a button. 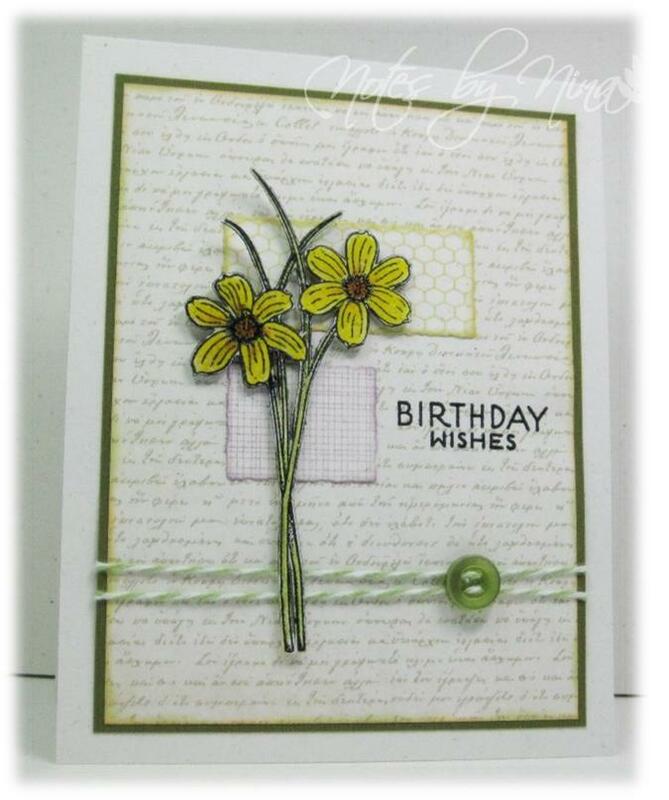 Check the Scrapbooker's Paradise online store for the Echo Park Paper pack and twine used in this project. Supplies: Natural White and navy card stock, Designer Paper-Echo Park, The Alleyway Stamps-Gotta Bug, twine, button, Spellbinders. 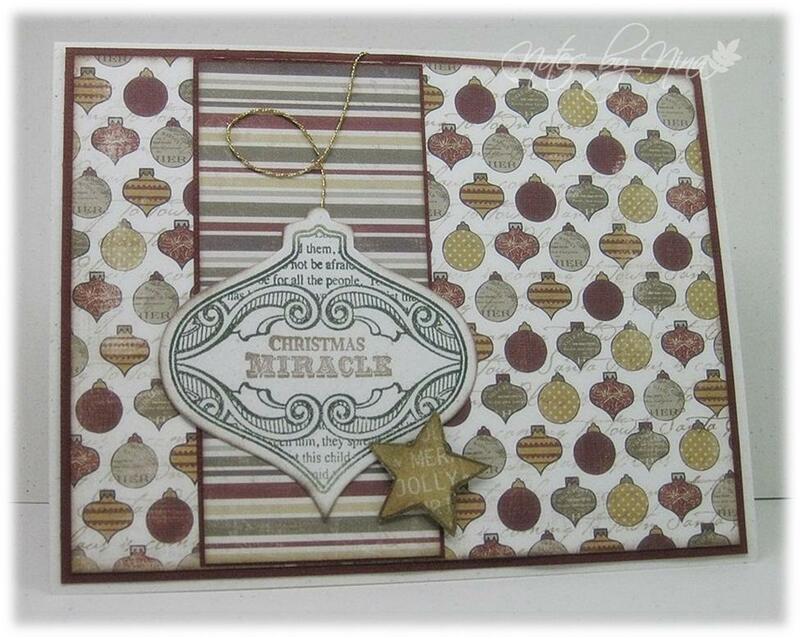 Please stop by the Scrapbooker's Paradise blog to see what the challenge team has created. Play along with the challenge and you could win a prize pack.